Foods, supplements, and nutrient-infused topical products have arrived on the skin care scene in a big way, attracting those looking to improve their outer health and retain their youthful radiance. The beauty biz is booming. Thanks to modern-day marvels such as BOTOX and microdermabrasion, women can retain their dewy appearance beyond the age of 35. Fifty has become the new 40 and 40 the new 30. Just gaze at the youthful countenance of Madonna, who will celebrate her 50th birthday this year, as an example of all that has changed. Baby boomers are more confident as they age, often choosing to stay in the workplace rather than retire and willing to spend their extra dollars on themselves. They are motivated to embrace the inner wisdom they’ve gained, as well as preserve their outer radiance. The 30-something crowd is also fighting to preserve their youth, spending beaucoup bucks on products and procedures designed to defer the signs of aging. Today’s woman allots more time to grooming to reduce the visible signs of aging, according to the 2003 report “Fear of Aging” by Datamonitor. Older consumers are particularly open to adding dietary supplements as a health strategy, as well as investing in luxury skin care products that minimize the effects of aging. However, this phenomenon is not limited only to females. Men are starting to realize that their appearance can improve their success in many aspects of their life. The Natural Marketing Institute’s 2007 Health & Wellness Trends Report noted that men’s personal care is the fastest-growing segment in the bath and body care category, driven by what they call the massification of metrosexuals. Yesterday’s skin care regimen for defying age was more focused on harsh, chemical-laden products or invasive procedures, but today’s emphasizes natural, healthy approaches to antiaging. New terms are entering the lexicon, such as beauty foods, cosmeceuticals, and nutricosmetics, which refer to ingestible products in the form of foods, supplements, or beverages marketed specifically for beauty benefits. Ingredients in such products include botanical actives, enzymes, proteins, antioxidants, and vitamins. People are also chasing the beauty of nutrients in topical forms to give skin a more radiant, youthful glow. According to “Wellbeing: A Cross Category Approach to Nutrition, Health, and Beauty,” a Business Insights report, consumers are demanding products that satisfy multiple health concerns, prompting a link between medicine, nutrition, and beauty. And there’s nothing novel about turning to nature’s bounty for beauty. Many ancient cultures used foods and plants for health and beauty purposes. Cleopatra was famous for her camel’s milk and honey baths. Ayurveda, an ancient holistic health practice that originated in India and involves the use of botanicals, oils, and massage, is enjoying increased popularity in the West. Today’s cosmeceutical philosophy draws on ancient traditions updated with a dose of modern science to promote beauty from within. “I have lots of patients who consistently ask me about complementary medicine, including nutrition, lifestyle, and daily habits. These days, everyone wants to look as great on the outside as they feel on the inside,” says Sonia Badreshia-Bansal, MD, president and founder of Elite MD Advanced Dermatology, Laser, and Plastic Surgery Institute in San Francisco. Cosmetic companies across the globe are awakening to huge opportunities. The nutricosmetics market demonstrates growth of 10% to 12% annually. America’s obsession with youth will prompt the antiaging product demand to reach a projected $30.7 billion by 2009, according to the Freedonia Group, a market research company. Antiaging ingredients on the hot list include coenzyme Q10, soy and herbal extracts, lutein, lycopene, black cohosh, and red clover in dietary supplements and cosmeceuticals. While many companies specialize in cosmeceuticals, mainstream cosmetics companies are now adding wellness beauty lines to their product list. As we age, time continues its march across our face. Collagen and elastin—substances that give skin its firmness and elasticity—gradually decrease. Subsequently, skin becomes more loose, weak, and dry, as well as less elastic. As the fat pads under the skin begin to disappear, wrinkles form and the skin begins to sag. Genetic influences, cumulative sun damage, and direct effects from cigarette smoking and abrasive chemicals all take their toll on the skin. While we’ve known for decades how important nutrition is for maintaining healthy skin, little research has been done about the effects of diet on skin’s aging appearance. But findings are trickling in that illuminate the roles nutrients may play. “As more research emerges, it is becoming increasingly clear that our food choices are very empowering and that we can increase our vitality and improve health from head to toe with our food choices. This includes skin,” says Cheryl Forberg, RD, author of the upcoming book Positively Ageless: A 28-Day Plan for a Younger, Slimmer, Sexier You. 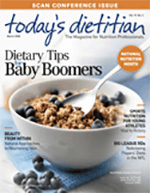 According to the American Academy of Dermatology, nutrients that look particularly promising in fighting the signs of aging include tretinoin, a substance in the vitamin A family that has been shown to reduce fine wrinkles, splotchy pigmentation, and rough skin associated with chronic sun exposure; alpha hydroxy acids derived from fruit and milk; retinols of the vitamin A family; and topical antioxidants, especially vitamins C and E, which function to help cells repair damage caused by ultraviolet radiation and smoking. So how can you unearth the true beauties at the cosmetic counter? “Many antiaging products make claims that are not scientifically validated. If a specific product is making a claim, look to see if the research has been published in a peer-reviewed journal,” says Erin M. Welch, MD, assistant professor of dermatology at the University of Texas Southwestern Medical Center. According to Welch, a base of studies have proven that vitamins A and C can provide skin benefits, but it’s a big stretch to take findings from a few laboratory studies on some topical nutrients and use them to substantiate a product that will produce results in people. It may be easy for a dietitian to dismiss the plethora of beauty pills, foods, and ointments as nothing more than snake. But in doing so, a dietitian may miss out on an important part of the future practice of dietetics. “As a dietitian, instead of immediately throwing out the validity of products, one should review the science currently available and understand the new science that is emerging every day. The technology in scientific studies has changed over the years, improving our ability to see and measure improvement in skin quality. Skin is the largest organ of the body; what we put into our bodies will be seen on the outside. We care about nutrition and its role in the heart, liver, and kidneys, but what about the skin?” urges Todd. “There is an inexplicable synergy when a variety of antioxidant-rich, nutrient-dense antiaging foods are combined in moderation. An antiaging diet rich in fresh fruits and vegetables, whole grains, cold water fishes, lean protein, legumes, traditional soy foods, nuts, and seeds is the easiest and most enjoyable way to protect your skin from the inside out,” says Forberg. As the public becomes more interested in the interface of skin and nutrition, they will hopefully seek out dietitians to help guide them. Will you be ready? 1. Cosgrove MC, Franco OH, Granger SP, et al. Dietary nutrient intakes and skin-aging appearance among middle-aged American women. Am J Clin Nutr. 2007;86(4):1225-1231. 2. Purba MB, Korris-Blazos A, Wattanapenpaiboon N, et al. Skin wrinkling: Can food make a difference? J Am Coll Nutr. 2001;20(1):71-80. 3. Burke KE. Photodamage of the skin: Protection and reversal with topical antioxidants. J Cosmet Dermatol. 2004;3(3):149-155. 4. Fazekas Z, Gao D, Saladi RN, et al. Protective effects of lycopene against ultraviolet B-induced photodamage. Nutr Cancer. 2003;47(2):181-187. 5. Segger D, Schönlau F. Supplementation with Evelle improves skin smoothness and elasticity in a double-blind, placebo-controlled study with 62 women. J Dermatolog Treat. 2004;15(4):222-226.